Intercalated discs are microscopic identifying features of cardiac muscle. 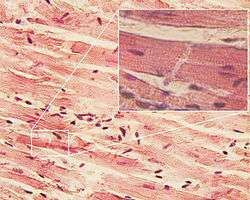 Cardiac muscle consists of individual heart muscle cells (cardiomyocytes) connected by intercalated discs to work as a single functional organ or syncytium. By contrast, skeletal muscle consists of multinucleated muscle fibers and exhibit no intercalated discs. Intercalated discs support synchronized contraction of cardiac tissue. They occur at the Z line of the sarcomere and can be visualized easily when observing a longitudinal section of the tissue. Three types of cell junction make up an intercalated disc — fascia adherens, desmosomes and gap junctions. Fascia adherens are anchoring sites for actin, and connect to the closest sarcomere. Desmosomes stop separation during contraction by binding intermediate filaments, joining the cells together. Desmosomes are also known as macula adherens. Molecular, biological, and comprehensive studies have shown that intercalated discs consist for the most part of mixed type adherens junctions, termed composite junctions or areae compositae (singular area composita). These represent an amalgamation of typical desmosomal and fascia adherens proteins (in contrast to various epithelia). Thus cardiomyocyte adherens junctions differ from epithelial adherens junctions and desmosomes. ↑ Franke, Werner W.; Borrmann, Carola M.; Grund, Christine; Pieperhoff, Sebastian (2006). "The area composita of adhering junctions connecting heart muscle cells of vertebrates. I. Molecular definition in intercalated disks of cardiomyocytes by immunoelectron microscopy of desmosomal proteins". European Journal of Cell Biology. 85 (2): 69–82. doi:10.1016/j.ejcb.2005.11.003. PMID 16406610. ↑ Goossens, S.; Janssens, B.; Bonne, S.; De Rycke, R.; Braet, F.; Van Hengel, J.; Van Roy, F. (2007). "A unique and specific interaction between T-catenin and plakophilin-2 in the area composita, the mixed-type junctional structure of cardiac intercalated discs". Journal of Cell Science. 120 (12): 2126–36. doi:10.1242/jcs.004713. PMID 17535849. ↑ Mahoney, Mỹ G.; Müller, Eliane J.; Koch, Peter J. (2010). "Desmosomes and Desmosomal Cadherin Function in Skin and Heart Diseases—Advancements in Basic and Clinical Research". Dermatology Research and Practice. 2010: 1. doi:10.1155/2010/725647. PMC 2946574 . PMID 20885972. Histology image: 22502loa – Histology Learning System at Boston University — "Ultrastructure of the Cell: cardiac muscle, intercalated disk "